Part of our choir, including Miriam, wearing her surplice for the first time. Sunday, 12 October saw Miriam Dodd receiving her surplice, so becoming a full chorister. In a ceremony at the start of the Choral Eucharist, Miriam was admitted to choristership and was vested in her surplice by the Rector of Grimsby, and proud dad, the Reverend Canon Andrew Dodd. 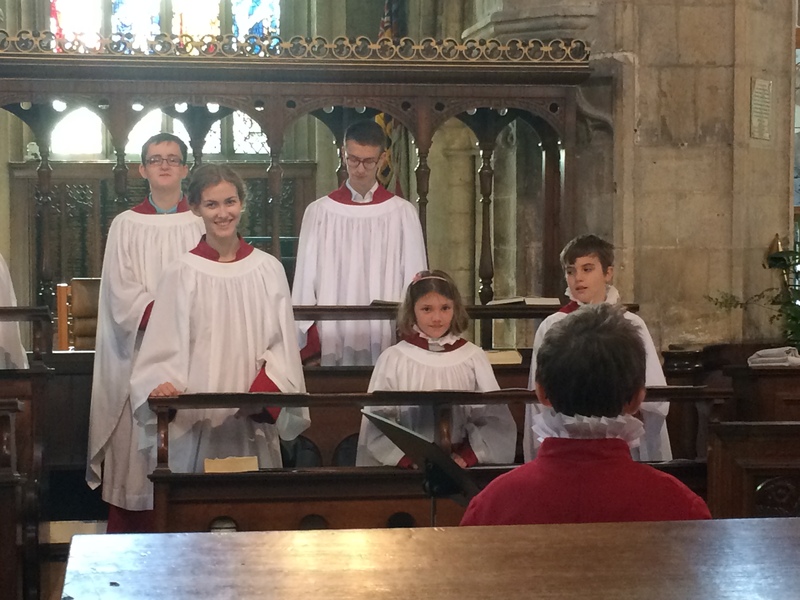 When choristers first join the Minster Choir, they spend about a year or so as a probationer. At the end of their probationary period, they are awarded a surplice and become a full chorister. Very many congratulations to Miriam on her achievement! This entry was posted in Uncategorized and tagged Andrew Dodd, ceremony, choir, Choral Eucharist, chorister, choristers, Grimsby, Grimsby Minster, Minster, probationer, surplice, surplicing, the Reverend Canon Andrew Dodd. Bookmark the permalink.